How are solar panels connected in series? 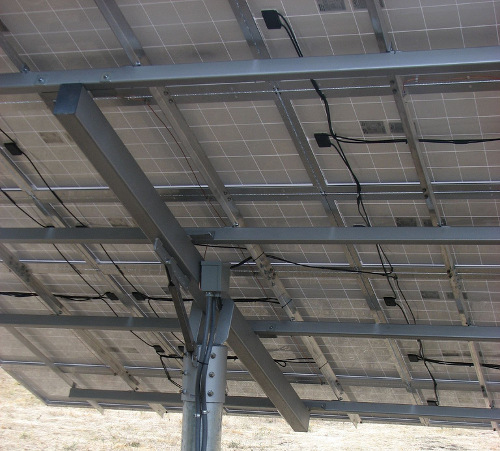 A solar array is really a multi-level string of solar-energy collecting units. Solar panels, which are themselves comprised of a collection of solar cells, are generally connected in series, meaning one panel is plugged into the next – sort of like Christmas tree lights. Connecting solar panels in a line, or series, allows you to build up the voltage to the level you need (as opposed to parallel wiring which allows you to increase current). Wiring solar panels in series is easy: connect the positive terminal of one panel to the negative terminal of the next panel. The resulting outer positive and negative terminals from this series connection will produce voltage which is the sum of the voltages of all panels. In such a connection, the current or amperage will remain the same. For example, if each panel has the potential of producing 12 volts @ 220 Amp hours and six panels are connected in series, then it can create 12 X 6 = 72 volts @ 220 Amp hours. The major limitation of series wiring is that performance is adversely affected if all its cells are not equally exposed to the sunlight or some of them are partially shaded. Whether this shading is caused by a neighbor’s trees, leaves falling on the panels, snow, or bird droppings, you may lose between 20% and 40% of the potential output of your solar installations because of shade. Just like Christmas lights, if one of them doesn’t work, they all go down and the whole system becomes inefficient. The solution to this problem is designing the rooftop installations carefully to avoid any shading. But in the situations where partial shading cannot be avoided, the system can be equipped microinverters or “bypass diodes” to reroute the current around the underperforming or shaded cells, though the rerouting will result in the loss of potential energy from these cells and also lowering the entire string’s voltage. This is why, unfortunately, trees can be the enemy of solar panels, and they may have to be removed before installation can occur. Can anyone help me understand how to accomplish the following? I bought three 40mm 12v .07A computer fans and would like to set them up so they are powered through as small a solar panel or , if I don’t need to buy a 12v panel, can I group of the appropriately sized cells into an array which is adhered to a mount that would be placed outside of a window. Since I would like to do this as cheaply as possible, do I really need the 12v panel, (which I would buy on Ebay) or can I simply buy tree PV cells of the appropriate rating? Some of the you tube stuff mentions using voltage regulators and the like. Are those required only when the power source is greater than the total draw? Are there PV cells wherein I could get away with one cell per fan? Where can I buy (U.S.)? Will I need to add a rechargeable battery to this in order that it runs 24/7. How do I do that and where and how would I wire it? Below is and image of what I am attempting to achieve. Of course I would like to make it run 24/7 but cant even begin to understand that whole adding a battery pack thing so any suggestions or comments would be greatly appreciated.